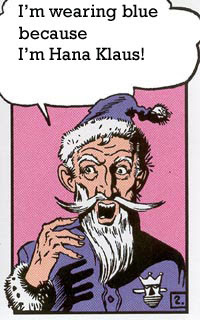 I just found this article in the Jonah Hex Corral. It's an interview with Michael Fleisher and covers a few points in "The Holdout!" about how the artist was wanting to make changes to the story. It also covers a lot of other ground in his career and Jonah's history. Very good reading. The Pitchman is back & this time he is bringing the Star Wars with him. 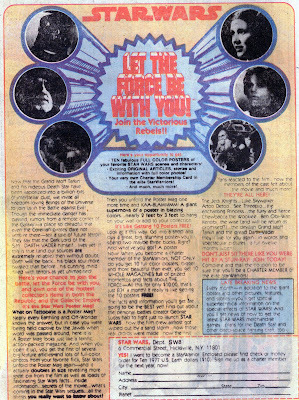 You can be part of the Star Wars fan club!!! Just be sure to send your 1977 Earth dollars. 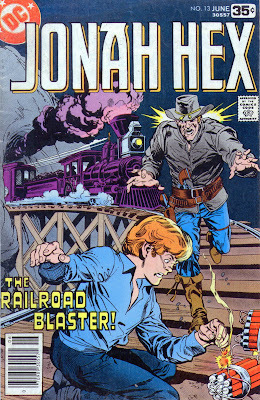 Jonah Hex #13 "The Railroad Blaster"
Location: A Union Pacific passenger car near Guthrie, Oklahoma Territory in 1874. Can you count the mistakes in that sentence? Anyway, this is the first story not written by Michael Fleisher in 28 issues. This story takes place after Jonah gets away from the Louisiana crazies so he is taking a train through the Oklahoma territory in the north central part of the state. We see a hand lighting some dynamite and then we are shown that the dynamite is next to the tracks. The splash page is a huge explosion with the train tossing everyone about. Earl & Virgil, two ruffians, decide to take advantage of the confusion and start robbing folks. They steal a woman's purse and knock a man out before they hear a voice ask if they really want to take the purse because it doesn't go with their outfit at all. 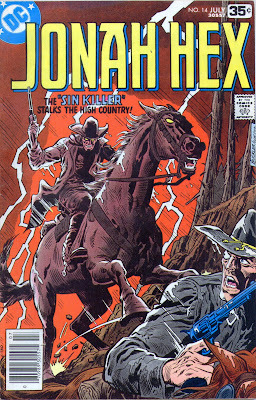 Jonah Hex is standing behind them with his hand casually resting up in the overhead storage. Virgil notes that Jonah's holsters are empty and draws on Jonah. Suddenly the overhead compartment erupts when Jonah squeezes the trigger on the shotgun he had hidden there. Earl gets three shots off but Jonah dives and unloads the second barrel into him. 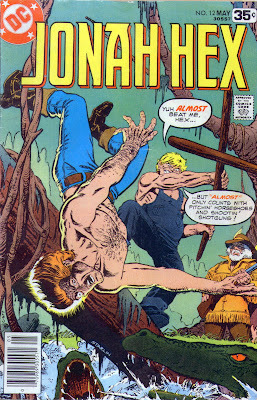 Jonah congratulates himself on his foresight of takes the shotgun from the swamp crazies he tangled with but he is interrupted by the man that was beaten up. 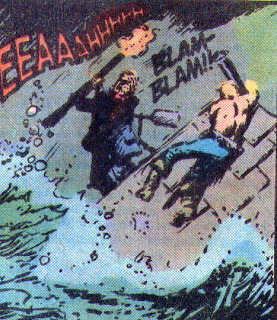 The man berates Jonah for endangering them all by discharging firearms in close quarters. 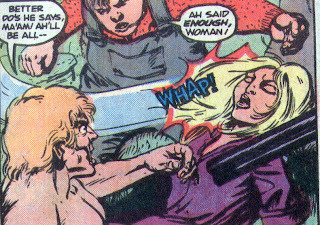 Jonah responds by punching him with the woman's purse. A few hours later, several wagons from nearby Guthrie show up to investigate the explosion. In town Jonah is lamenting that he only has 50 cents to his name. Down the sidewalk comes a small boy running from a shopkeeper. The boy has stolen a small bag of grain and runs into Jonah. The shopkeeper catches the boy, but Jonah intervenes and gives the man a quarter for the grain. The man starts to protest but Jonah quietly says that the quarter will cover it. Jonah sends the boy on his way with an admonition to not let thievin become a habit. A short while later in the saloon Jonah is about to get a drink when a man by the name of Reuben Gittes offers to share a bottle with him. Jonah takes up the offer and the man says that he has admired the fine way that Jonah handled the purse-snatchers on the train and then calls him by name. Gittes explains that he has a pistol under the table aimed at Jonah and that Gittes work for the Pinkerton Detective Agency. Gittes explains that he isn't after the bounty on Jonah, he has been sent to Guthrie to investigate a series of explosions that have been plaguing the railroad. He has been offered $5,000 to bring in the saboteur. He knows Jonah reputation for tracking down men and offers Jonah $1,000 to help him. Jonah asks why Gittes doesn't just kill him now & collect the $10,000 on his head. 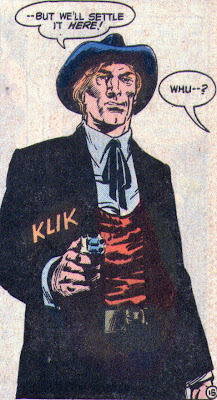 Gittes explains that it would do his health no good to be known as the man who killed Jonah Hex. Jonah agrees to Gittes' terms and starts tracking the saboteur. For hours he follws a trail that appears to be made by two people with a wagon that has a 'bum wheel'. Eventiually he comes upon a large ranch that has seen better days. As he rides up the owner, Roy Cooper, steps out and threatens Jonah with a rifle. Just then the young boy, Billy, Jonah helped earlier runs out of the house and explains that Jonah paid for the grain. Roy apologizes and explains that there have been robbers in the area and he has to be careful. Roy continues working on repairing his buckboard wheel and eventually starts bad mouthing the railroads. He catches himself and then invites Jonah for dinner. During dinner, Jonah probes for Roy's opinion of the railroad and Roy starts talking about how the railroad has started taking cattle drives away and a man like him has a hard time making ends meet. After dinner Jonah excuses himself and leaves only to climb a nearby hill so that he can continue to watch the cabin after dark. Soon, Roy & Billy get in the buckboard and Jonah follows them to a railroad trestle. The tracks come around a huge bend near some rocks and then go across a gorge. Roy's plan is to blow up the rocks and knock them onto the track. Billy asks why they just don't blow up the bridge. Roy explains that the engineer will see the rocks and have time to stop the train. If the trestle was gone folks would die in the crash. 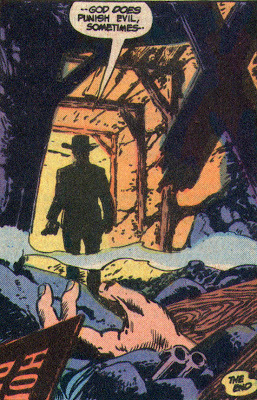 Jonah steps out from the shadows, pistols drawn. Jonah says that he is going to have to take them in but then Gittes steps out behind Jonah. Gittes tosses some ankle-irons to Jonah and tells Jonah to put them on himself so Gittes can collect the $15,000 himself. Gittes laughingly explains that his plan is to kill Jonah for the $10,000 and then kill Roy for the $5,000 but he will explain that Roy killed Jonah first. Before Gittes can pull the trigger, Billy jumps up on a boulder with a stick of dynamite and a match. Billy tells Gittes to drop the pistol. Gittes decides to drop Billy instead and shoots the boy. Billy falls backwards onto the trestle and the dynamite explodes. Roy lunges at Gittes but is gunned down and when Jonah attempts to tackle Gittes he falls, due to the ankle-irons and Gittes pistol whips him. Gittes is about to shoot Jonah in the head when he is knocked out with a rock by Roy, who dies right afterward. Sometime later we find Gittes shackled to the railroad track. Jonah is sitting atop his horse next to him. 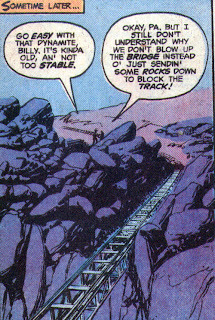 Jonah explains that since the bridge is blown up somebody has to warn the train but since Jonah is going to be busy burying Roy and Billy, Jonah will leave Gittes there. Gittes starts screaming that it is still too dark for the train to see him. Jonah says that's not a problem. the train will stop to find out what the big bump was. Jonah turns and rides off, leaving Gittes screaming in the dark. Timeline - 1874. But, let's go back to the first sentence. The Union Pacific does run through Oklahoma, starting in 1964. Guthrie, Oklahoma was founded on April 22, 1889 during one of the land runs. The previous issue took place around 1876 & 1877 due to a timeline continuing from a reference to Mexican President Porfirio Diaz. I think any ranting at this point would be pointless. But, understand that I am ranting on the inside. Besides all of this, I did enjoy this issue with Gittes pulling a great double-cross and everyone threatening everyone else with dynamites, rock, rifles & pistols. 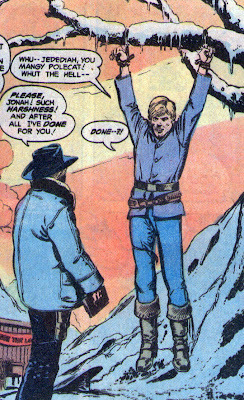 Jonah is kinda helpless through the whole thing but gets the final say in a very gruesome EC kinda way. Next Issue: More bad geography and Jonah almost gets religion. 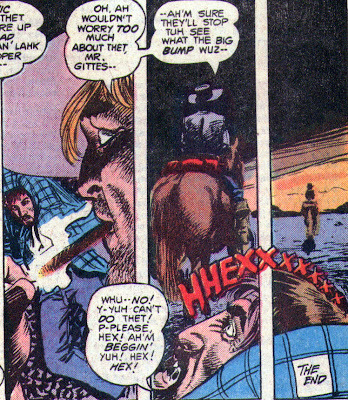 Jonah Hex #12 "The Search for Gator Hawes!" "The Search for Gator Hawes!" Jonah is in a dugout canoe paddling through a Louisiana bayou looking for his pal Gator Hawes, who went missing 2 months ago. Jonah is thinking about the dangers of being in a dugout and the only problem is being swamped by a gator. Of course, a mind-reading alligator picks that time to slam into Jonah's canoe, knocking him into the bayou. The gator and his buddies, obviously working at the direction of minds stronger than theirs, proceed to tear off Jonah's shirt, but not before Jonah buries a knife into one gator & drives the other off. Jonah surfaces, gasping for breath and is helped to shore by an old man and his huge hunk of a son. The pair, Josh & 'Pappy', take Jonah to their cabin where they meet the third member of the family, Isabella. Josh explains that Isabella is the homeliest woman in the world and tells her to explain why she doesn't get married. Isabella, looking at the ground, mumbles that it is because nobody wants her. Josh keeps goading her and Isabella says that she is ugly as a mud fence. Jonah protests at this verbal abuse and Josh punches Jonah in the stomach and then in the head, knocking him out. Josh takes Jonah and tosses him into a cage along Gator Hawes. Gator is begging for food but Josh tells Gator that Gator has to beat Josh at pole-wrasslin' before he gets to eat. Jonah wakes up and Gator explains that he was kidnapped two months ago and the only way he has stayed alive was by eating rats & toads. Jonah says that they have to find a way out but Gator, pointing a couple of skeletons, explains that the only way out is the way those poor fools got out. The next day Jonah is let out and taken to a fallen tree across the river. Josh is going to pole-wrassle Jonah. If Jonah wins, he gets food. Pappy is sitting in a dugout with a shotgun in case something goes wrong. Josh just keeps yapping as they start fighting and Jonah stabs Josh in the groin with the end of the pole. He then hits Josh in the throat, knocking him off the tree. Jonah jumps off the tree and starts to take off but Pappy unloads the shotgun and hits Jonah in the head, knocking him out. Jonah comes to back at the cabin with Isabella tending to his wound. Josh tells her to get away from Jonah and he backhands her, knocking her down. Josh throws Jonah back in the cage and leaves. Sometime later Isabella comes back to the cage and Jonah tells her that she isn't ugly, in fact she is beautiful. The next day Josh & Pappy let Gator & Jonah both out. They are going to make them pole fight each other and the loser will be fed to the gators. Jonah & Gator are on the tree with Gator being almost too weak to hold the pole. Josh & Pappy are in the dugout, jeering them on. Jonah whispers to Gator to hit him as hard as he can. Gator swings and Jonah falls off the log and into the river. He surfaces under the dugout and knocks Pappy & Josh into the river. Jonah jumps into the dugout, paddles towards the log & tells Gator to jump in. Gator jumps, falling & hitting his head and this leaves Jonah on his own to try to get out of the bayou on his own. Eventually they come to a fork in the river and Jonah picks the left side but shortly the current is getting faster & faster because.... you guessed it, there is a 50 foot waterfall smack in the middle of the bayou. Jonah yells at Gator to wake up and he grabs Gator and jumps for an overhanging tree. Jonah tells Gator to hang on, but Gator is too weak from lack of food and drops into the river, being swept over the falls. Jonah climbs down the tree and is greeted by Pappy & Josh standing over him with the shotgun. Josh beats Jonah up and they throw him back into the cage. They starve Jonah for several days until one stormy night Isabella shows up asking Jonah if he really meant that she was beautiful. She asks if she lets Jonah out, will he marry her. Jonah agrees to the wedding and just as Isabella opens the cage, Pappy shows up and shoots Isabella. Jonah throws open the cage door, knocking Pappy backwards and knocking him out. Jonah grabs the shotgun and find that Pappy isn't carrying any shells. In the cabin, Josh is tending his collection of poisonous snakes. Jonah kicks in the cabin door, boots Josh in the groin and punches him in the gut. Pappy shots for Jonah to stop and there is Pappy standing in the doorway with the shotgun, explaining that he grabbed some spare shells from the dugout. Jonah dives forward, tackling Pappy around the ankles. The shotgun goes off as Pappy falls forward. All of the jars of poisonous snakes are shattered and they attack Josh. Jonah dives out the cabin window to find that the storm has caused the river to flood. He climbs up on the roof and finds that Pappy has followed him. The waters keep rising and just as Pappy is ready to shoot Jonah the river causes the cabin to lurch and the weather vane on the roof stabs Pappy through the heart. Jonah spends all night on the roof in the storm. The next morning he locates the dugout and heads home. Jonah's Injuries - Bit by a gator, shot in the head, beat up & knocked out twice. Timeline - There is no evidence that this issue follows the previous one, but next issue contains a reference to this one, so Jonah is still on the run here putting this in 1876 or 1877. Alcazar's artwork is terribly dark and muddy, which should work in a story about a swamp, but I just don't care for it. The fact that a bayou, a low lying body of water would have a 50 foot waterfall just killed most of this story for me. Josh & Pappy are both wonderfully murderous and evil and they both get what they deserve. The story doesn't really advance Jonah at all, so this story is just so-so. Next Issue: - Jonah spends time in Oklahoma Territory, a lot of stuff gets blown up, and most amazing, Fleisher doesn't write it!! !